The word "page-turner" is overused for so many crime fiction novels and thrillers. It is spot-on for Caitlin O'Connell's first Catherine Sohon Elephant Mystery. 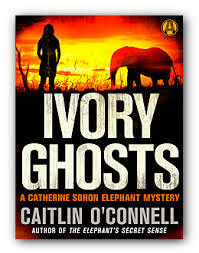 With her theme of ivory trafficking and elephant poaching, O'Connell has created her own thriller sub-genre: the wildlife conservation thriller. (Environmental thrillers tend to have plots involving bioterrorism, but O'Connell places the spotlight squarely on the slaughter of elephants for their tusks to feed the real beast--ivory trafficking). Her protagonist, Catherine Sohon, is well-developed, and O'Connell uses a first-person narrative. Catherine is a white American wildlife blogger who has been living and working in South Africa. She's grieving the recent death of her fiancé. O'Connell imbues her with a lot of depth and emotional complexity. In the opening scene, after her truck breaks down on a remote, dry road in the sub-Saharan African country of Namibia, Catherine stumbles on a horrific murder scene. She has traveled to Namibia under the guise of doing an elephant census, but Catherine's actual purpose there is to substantiate evidence and put a stop to an ivory trafficking ring. As a woman reader (and writer), I appreciated that O'Connell wrote this scene, using the first-person, without giving any initial indicators of whether the narrator was a man or a woman. Speaking from my previous experience as a "book scout" for a producer at Warner Bros., this thriller would make a riveting film adaptation which, with the right screenplay, could give an actress a pivotal career opportunity. The pace is breakneck, yet the stylish writing allows the reader to absorb a lot of fantastic (and horrifying) content and facts about ivory trafficking, and about Namibia. The scope is international and yet the action and the details are of a very specific place. The villains are terrifying precisely because they are portrayed in all their humanity and greed. Catherine may even have a new romantic opportunity with the Minister of Conservation, Jon Biggs. Their vexatious conversations barely conceal the sexual chemistry between the two characters. Then, of course, there are the elephants. Scenes with the elephants were so galvanizing, and could not make a stronger case for why poaching is such a reprehensible crime. O'Connell's thriller leaves no room for debate that it is a moral imperative to stop and prevent ivory poaching. Trafficking seeps its evil into everything and everyone it touches. Caitlin O'Connell is an ecologist and a scientist, a world-renowned expert on elephants and vibrotactile sensitivity (vibrotactile means "Relating to or involving the perception of vibration through touch."). She has been documenting elephants in Namibia for the past twenty years as a writer, photography and filmmaker. Her nonfiction science memoir THE ELEPHANT'S SECRET SENSE was an internationally acclaimed work. This Renaissance woman may now add "expert thriller writer" to her resume. I eagerly await the sequel to Ivory Ghosts. Thank you to Alibi, an e-originals imprint of Penguin Random House, for the opportunity to read the digital copy via NetGalley. Wow! What a review! Definitely one to read. It's such an important topic, and the author's credentials make reading it sound all the more worthwhile. I can think of a few environmentalists who would like to buy this book. Thanks for such an exciting review. I hope someone takes up your movie suggestion - your comment on a strong female role is valuable, and interesting that gender of protagonist was not revealed initially. Lots of interest in this one! Thanks!